They touched down at Joint Base Andrews, on the outskirts of Washington, at 3.40pm. 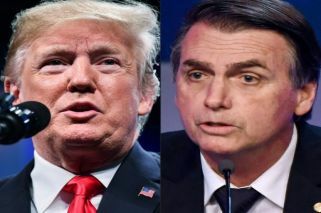 But Bolsonaro, like other members of the mostly Latin American Lima Group, has ruled out military action in favour of a policy of tightening the economic and diplomatic pressure against Maduro. On Sunday night, Bolsonaro dined at the residence of Brazilian Ambassador to Washington Sergio Amaral with "opinion makers" including, according to press reports, Bannon and US-based Brazilian writer Olavo de Carvalho, considered Bolsonaro's ideological guru. Wall Street Journal columnist Walter Russell Mead, American Conservative Union president Matt Schlapp and Chris Buskirk, who edits the blog American Greatness were among others expected at the event.